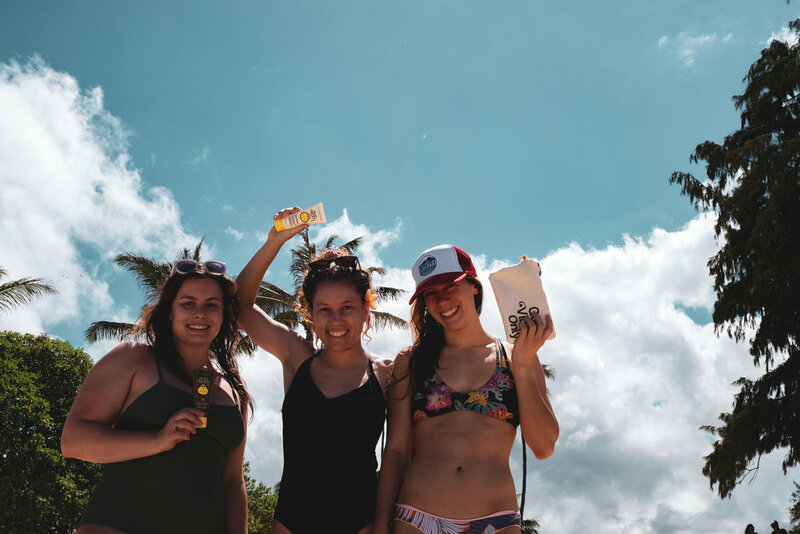 Here you will find reports of women surf events around the world, surf-related community projects, ways we as surfers can help our environment, short interviews, writings, and more! Most images above are by Tyler Feague. From March 25th through March 31st, Sea Together and Ninety Collective held a retreat in Hawai’i, on Oahu’s North Shore! Retreat-goers stayed at an off-the-grid sustainable location that was solar-powered and filled with wild horses and peacocks. The week was jam-packed with surfing, wellness activities, fun times, and lots of karaoke sprinkled in between events! Other highlights included a sustainable fashion and lifestyle conversation with Kelsey Van Patten; yoga led by Jen Yih of Ninety Collective; and a creative writing workshop led by Brianna, Founder of Sea Together. A big thank you to all of our retreat sponsors: GoMacro, Knixwear, Navitas, Nuun, SunBum, To-Go Ware, Indosole, Numi, Roamers, and La Bamba. Also, thanks to all who came to the Sea Together surf meet-up at Canoe’s. Special thanks to Buzz Busby for all of her help and Rebecca Price Baechle for all of her support, and to Tyler Feague for being our filmer of the trip. Stay tuned for the film of the retreat, which is coming in the next few weeks! Photos above of products from our awesome sponsors are by Jennifer Yih. The last two images, which feature La Bamba wetsuits and Indosole sandals, are by Rebecca of Craft Collective Hawaii.